Talking of Little Miss Muffet, the current Challenge is Scallops. Pop over to the Blog and see the wonderful creations from The Little Misses. And, if you need a little retail therapy, the Summer Sale is on until Tuesday 14th! 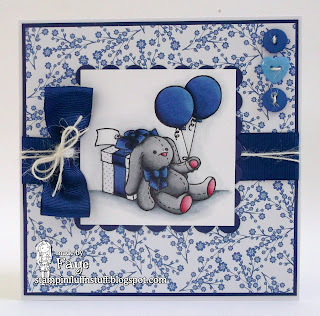 Your card is gorgeous, I love that cute image and your colouring is fabulous. That deep blue ribbon is beautiful. Yes, I'm totally with you there about the Remote control!! Gorgeous Faye! Birthday bunny is on of my favourites too! Fab colouring and I love the blues! Does SIL need a tetanus jab by The Doc then? Love how you have changed the position of the button holes. See I notice these things. Hugs Muver. Wow your card is a stunner & love the blue colours...they are fab!! Gorgeous card Faye, the blue is lovely I like the papers and the ribbon. 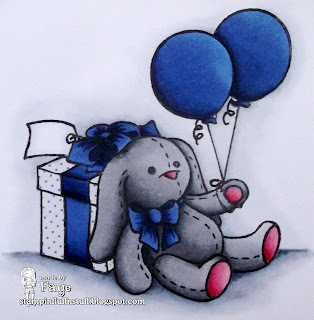 Feeling a tad blue myself today...is it normal to be having such hot pre-menopausal flushes at 21? I'm wayyyy too hot to comment on your luverlee card, too sweaty to say love those papers, they're too good to use on riff-raff! Beautiful card faye and love the blue colour. I have never used Copics before. Hope you have had a good weeknd and hubby is fine now with the remote!! ha ha ha that will teach Very Understanding to mess with the cat! Love your card the monochromatic blue is just excellent. Oh my word Faye this is absolutely gorgeous I love that image also the wonderful paper a superb card. Beautiful coloring Faye. Love the deep grays and blues together. Love your gorgeous, adorable card Faye. Oh what a beautiful cute card Faye!! Totally gorgeous and adorable Faye! Wonderful shading Faye and that deep blue is gorgeous. I say put Boo in charge of the remote, I mean you are home more then VUH and can bribe her with treats all day, right?